The current Miss OBU Brooke Schmidt will pass on her crown to the winner of this year’s pageant on Friday, Oct. 23. Photo courtesy of the News Bureau. Seven women will compete for the title of Miss Ouachita Baptist University on Friday, Oct. 23, at 7:30 p.m. in Jones Performing Arts Center on Ouachita’s campus. Tickets for the pageant are $12 each. Contestants will participate in on-stage question, lifestyle and fitness in swimsuit, artistic expression in talent, presence and poise in eveningwear competitions and a private interview. The pageant will be hosted by Ouachita’s Student Senate and directed by Ouachita alumnus Justin Harper. The winner of Miss OBU will represent Ouachita at the Miss Arkansas Pageant in July 2016 and receive a $1,000 scholarship and other prizes. 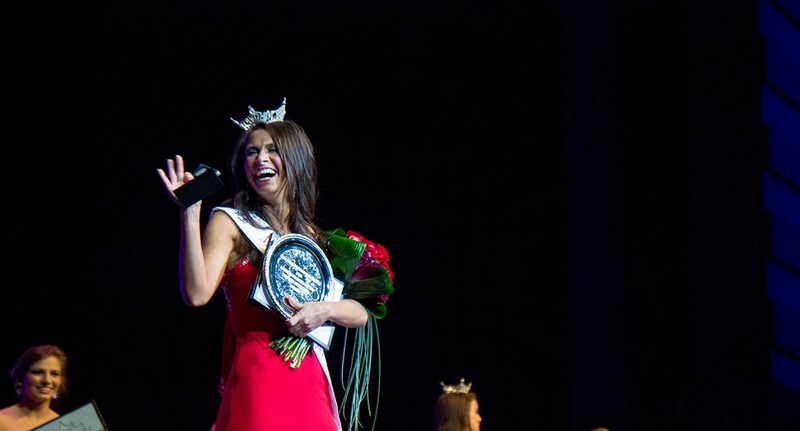 Previously held in early February, the pageant was moved up to the fall semester to allow the next winner additional preparation time for the Miss Arkansas Pageant. “I am excited because this is kind of a new year for us,” Harper said. “This new opportunity to move the pageant to the fall is a great one because campus spirit is really high right now coming off of Homecoming and a great football season. We are excited to add just another element of fun into the fall semester. Harper has served as executive director of the Miss Ouachita Baptist University Pageant since 2008 and was honored as this year’s “Miss Arkansas Executive Director of the Year” by the Miss Arkansas board. Contestants include Suzie Gresham, a senior from Hope, Ark; Stoni Butler, a senior from Camden, Ark. ; Mariah Gough, a junior from Smackover, Ark. ; Bethany Arredondo, a senior from Prosper, Texas; Kathryn Barfield, a senior from New Boston, Texas; and Lauren Ford, a sophomore from Cabot, Ark. Tickets for the pageant are $12 each for the general public and $7 each for current Ouachita students with a valid student ID and will be available for purchase at the door of the event. For more information, contact Ashlee Giles at gilesa@obu.edu.